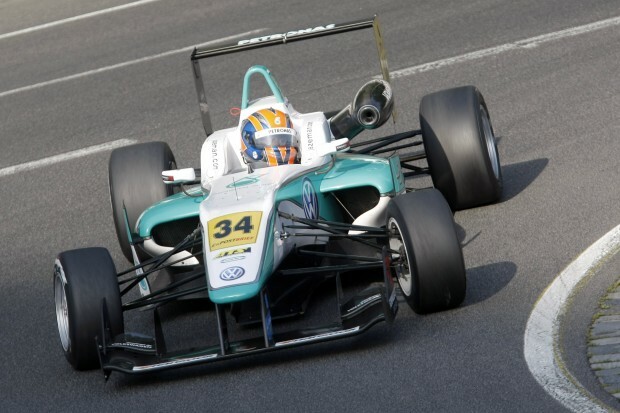 Jazeman Jaafar endured a weekend of luckless racing at Norisring in Germany this weekend, the sixth round of the British F3 International Series. Salvaging two seventh place finishes in the first two races was scant reward for the young Malaysian, and a retirement from the final race, Jaafar’s first non-finish of the season in British F3, was a lowpoint for him. Title rival Jack Harvey moved ahead of Jaafar in the Drivers championship, but with only four points between them, Jaafar is still very much in contention. Jaafar was an innocent victim of a first lap incident in the first race when Harvey outbraked himself and collided with the rear of Jaafar’s car, spinning the young Malaysian around and into the path of the cars behind. The incident forced Jaafar to pit for a new front wing, with the PETRONAS Talent Programme recovering well to finish in seventh place. The second race produced similarly chaotic racing and Jaafar was unfortunate to be in the thick of the action, and after jostling for position in the early stages of the race, the frenetic wheel-to-wheel action left the Malaysian driver with damage to his car, hampering his pace. Crossing the finish line in seventh place in the British F3 standings netted him a few more points, but not the haul that the 19-year-old has been taking in previous weekends. The third and final race of the weekend took place in a thunderstorm, which added to the challenges of the Norisring street circuit. The race started under the safety car, with the green flag waving after seven laps, but chaos ensued again, with numerous incidents in the next few laps and Jaafar caught up in one of them. He was unlucky to run over the discarded front wing of Will Buller after he had crashed, which resulted in damaged suspension on the PETRONAS-liveried car. Jazeman continues, “Things didn’t get much better in the second race and in the scrabble through the tight corners with the close barriers, I was squeezed over and brushed the wall, then banged wheels which damaged my car and slowed my pace. It was another case of hanging on in there and taking the points, but a bit frustrating. “Bad luck must come in threes,” concluded Jaafar. “The third race began in horrendous weather and I was really struggling to see much in front of me. I kept out of trouble in the opening lap, but then ended up tripping over front wing debris which damaged my car so badly I had to retire.